You'll have a handsome addition to your home walls with this beautiful clock. The piece comes in a Oak Yorkshire finish on select hardwoods as well as solids and features a gently arched bonnet. The ivory dial carries a polished-brass bezel, Arabic numerals and decorative hands while the matching pendulum has a decorative grid. 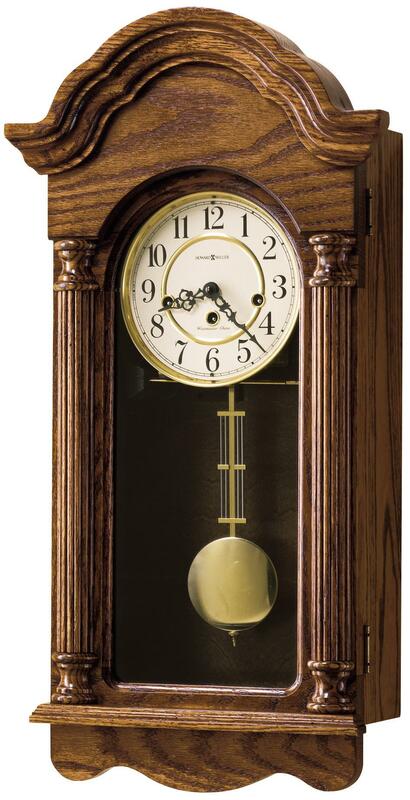 Plus, the key-wound, Westminster chime movement includes a chime silence option and durable bronze bushings. Accent your home in honest elegance with help from this wall clock. 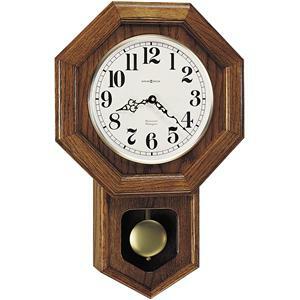 The 620 Daniel Wall Clock by Howard Miller at Wayside Furniture in the Akron, Cleveland, Canton, Medina, Youngstown, Ohio area. Product availability may vary. Contact us for the most current availability on this product. Pendulum Description Pendulum has a decorative grid. Chime Description Key-wound Westminster chime movement includes a chime silence option. Wood & Finish Oak Yorkshire finish on select hardwoods and solids. Browse other items in the 620 collection from Wayside Furniture in the Akron, Cleveland, Canton, Medina, Youngstown, Ohio area.